Gomena's first win came In the Maiden Flat with Devil's Wrangler. Jockey Sam Cockburn took the horse to an early lead and won easily over a field of six for Stonelea Stables. 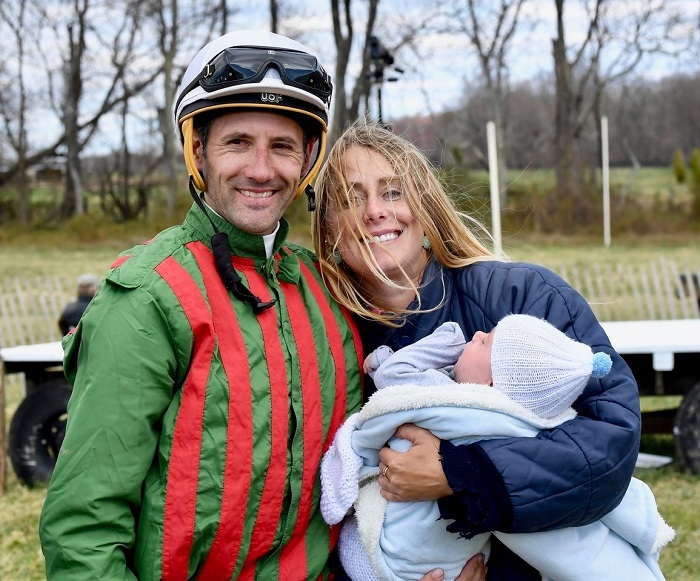 In the Open Hurdle, jockey Aaron Sinnot held Menacing Dennis off the pace until the final time around, passed two horses in the four-horse field, and took the lead away from Shamsaan in the final three-sixteenths of a mile to the wire. Le Chevalier (Kieran Norris up) is the Open Timber winner and the third win of the day for trainer Julie Gomena. In the Open Timber, Gomena put Kieran Norris up on Le Chevalier. Norris allowed Canyon Road (Barry Foley up) and El Jefe Grande (Graham Waters up) to battle it out in front through most of the race, asked for more approaching the last fence, and outran Canyon Road to the wire. 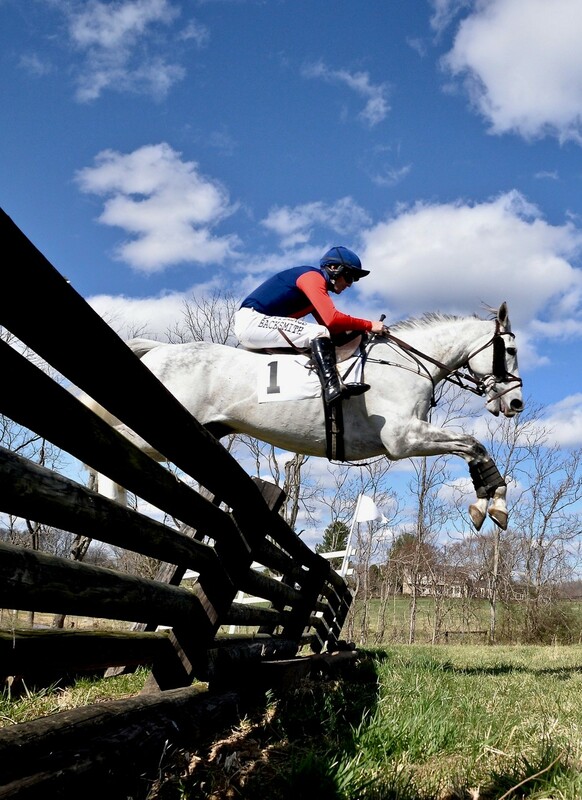 Le Chevalier, owned by Michael Smith, was last season’s Virginia Steeplechase Association’s Timber Horse Champion. Jacob Roberts, wife Iris Vandentoorn, and child Glen Ryder Jacobs. Dad won Division 1 of the Novice Timber race on Holiday Mousse, clocking the fastest time of the two divisions. Dr. Will Russell’s Holiday Mousse, trained by Neil Morris, won the first division of the Novice Timber race with Jacob Roberts in the irons. Appoggiatura set the pace for the field of five horses and Holiday Mousse stayed with him. Jeffery G. took the lead then faded the last time around. Holiday Mousse and Appoggiatura battled to the last fence, after which Holiday Mousse drew away and won easily by eight lengths. Number 3, King Of The Road (Graham Watters up) is first in the Maiden Hurdle; Go As You Please (Barry Foley up) to the left lost his rider. Trainer Jeff Murphy took King of the Road (Graham Watters up) to the winner’s circle after the Ellerslie Farm entry beat a seven-horse field in the Maiden Hurdle. Go as You Please shadowed King of the Road, the leader from the start. At the eighth fence, Go as You Please and jockey Shane Crimin parted company, leaving King of the Road clear to maintain his lead to the finish. To the right in the stretch run is Gordonsdale Farm's Overdrawn (Kieran Norris up), winner of the Open Flat race by 3/4 of a length over Trustifarian (Barry Foley up). 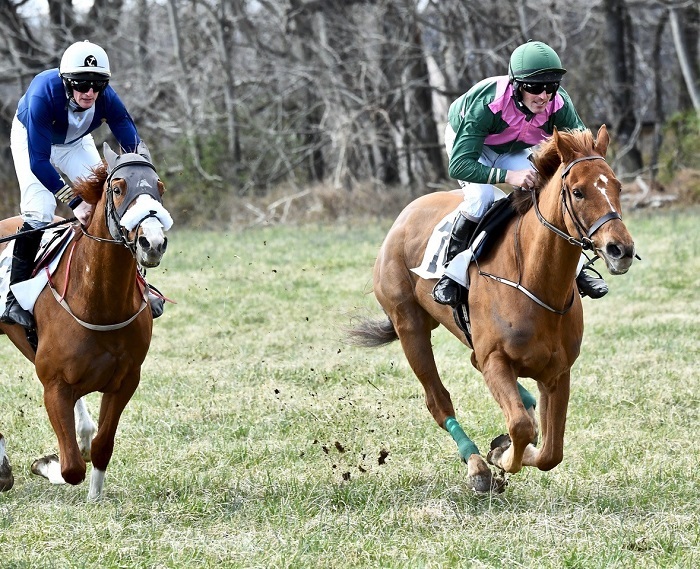 In the last race of the day, Open Flat, Overdrawn—trained by Orange County whipper-in James Piper for Gordonsdale Farm—finished first in the field of six. Glad Moon set the pace early on with Trustifarian (2018 VHBPA Virginia Bred Flat Series Champion) close behind. 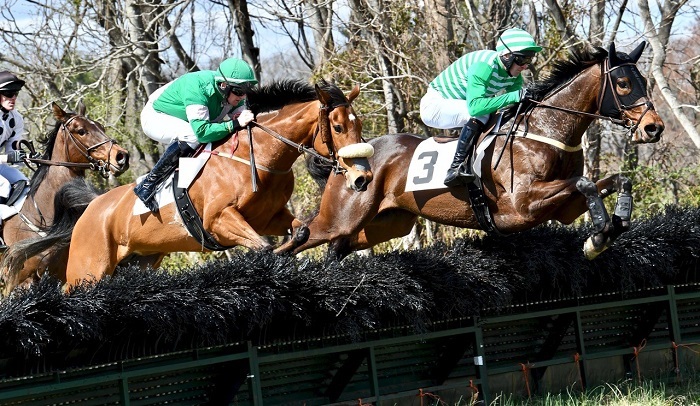 Overdrawn, staying within reach of the frontrunners, turned it on in the final half-mile, overtook the lead at the top of the stretch, and hit the wire three-quarters of a length ahead of Trustifarian. 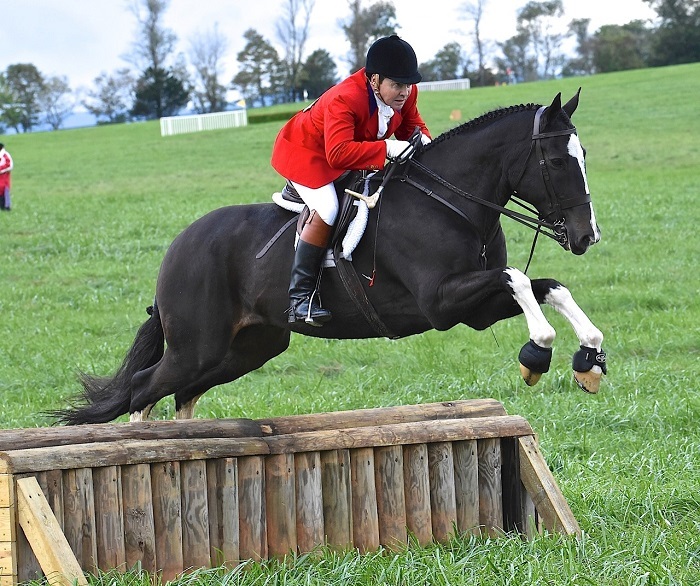 John Wittenborn and Soccer, representing the Smithtown Hunt (NY), win 2018 Theodora Randolph Field Hunter Championship in Virginia. 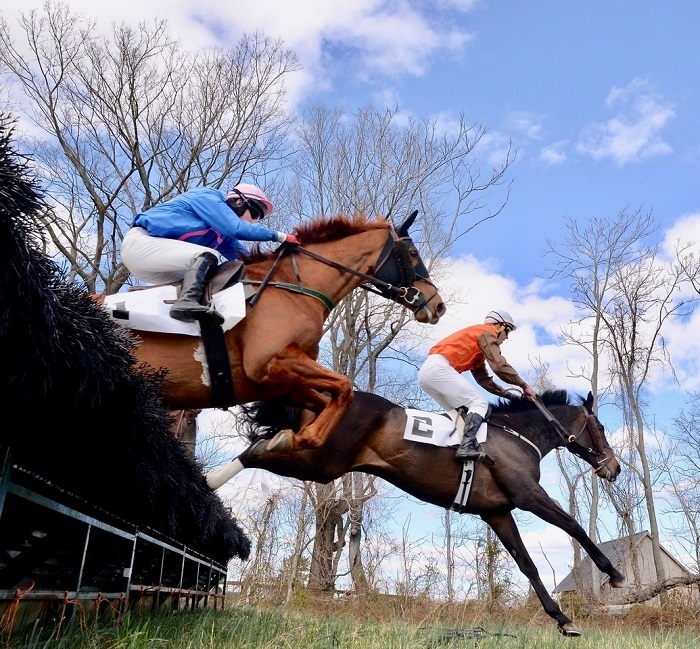 John Wittenborn and his fourteen-year-old Clydesdale-Thoroughbred cross, Soccer, returned home to Long Island and the Smithtown Hunt with the Championship Trophy and ribbon from the Theodora Randolph 2018 Field Hunter Championship in Virginia. Three tries was the charm for Wittenborn and Soccer. Last year the pair made a good showing, placing third. 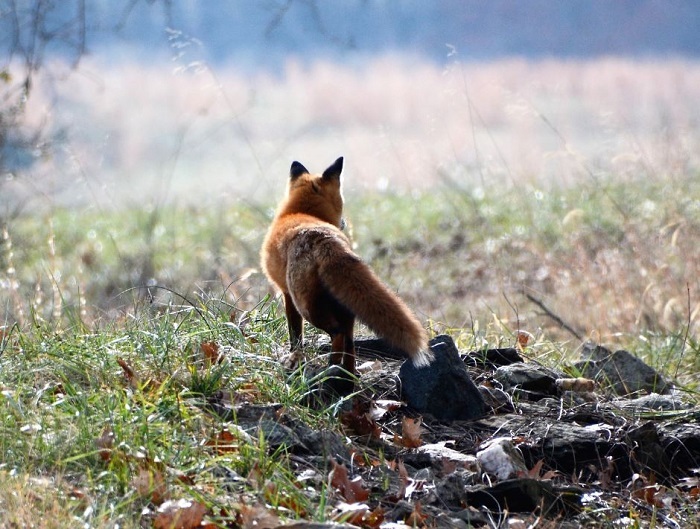 It was the first team from a northern hunt to have won the coveted prize in thirty-five years of competitions. And it was fitting; Mrs. Randolph was a northerner, though from Boston’s North Shore. Larry Wheeler, 16 x 20, oil on canvas, "Catch," Deep Run Hunt Here’s a final reminder, latest information, and sneak-preview of the Art Show at Morven Park to be presented by the Museum of Hounds and Hunting over the Virginia Foxhound Show weekend. The Opening at 4 PM and the Reception at 5 PM on Saturday, May 26, 2018, the day before the hound show, will be for Museum members, their guests, and the artists. The show opens to the public on Sunday morning, the day of the hound show, and the works will remain on display until June 25th.